This past summer Big Country Outfitters had the opportunity to expand our operation. The new guide area was really not that new to us, as we had worked a deal two years previous that ultimately fell through. Even before that, I had done some extensive research and became quite interested in this territory about two years before we ever tried to work a deal. Basically, we have been eye-balling this chunk of prime big game country for about the past five years...give or take. This past summer we had or chance to step up, and although it was a bit of a roller coaster ride for awhile, we finally secured our dream guide area. Big Country Outfitters now operates two separate hunting camps, the "Baker Creek" hunting camp and the "Big River" hunting camp......what does this mean to our clients? The Baker Creek camp still offers some great moose hunting, some incredible black and color phase hunting, some pretty decent mule deer opportunities, as well as the predators; wolf, cougar, lynx, and coyote. 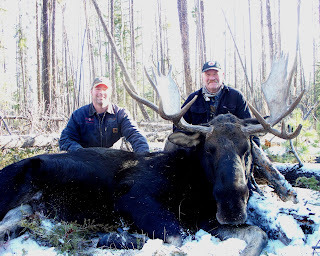 The new Big River camp offers fantastic moose hunting (the typical antler spread will exceed our more southern area), some crazy elk hunting, griz, black bear, white tail, mule deer, and wolf hunting. We are not exaggerating a bit, when we say we now have one of the highest quality hunting companies in the BC hunting industry today! We are very proud of the direction we are going and we are even more proud about he fact that we are not just seting the bar.......we are the new bar! Outfits will now start comparing their oufits and how they operate to BCO, it is exciting times folks. We are still somewhat in the "start-up" stage of our business, so marketing dollars are tighter then I would like. We are working hard to get the mesage out there, if you are thinking of coming to BC to hunt....think BCO! If we do not have it, we help you find the right outfitter that does. We are a "guide" based business, we are not owner/operators that simply see the $$$$$$ and cashing checks, god knows there are plenty of those out there. So give us a call, or drop us an email......even simply to comment on how you think we are doing......and make your next hunting experience a BCO experience. Soon after you've effectively wiped out a bear you will need to attach the kill tag supplied with your bear hunting license towards the bears lower jaw. You've 72 hrs to obtain the bear sealed following the kill you can do this at any DNR office or registration station. You can't take away the seal before the carcass is either processed, butchered or tanned. You can't search a bear around or in its living room. You are not permitted harass or trick a bear from it's completed to harvest it. No non-resident of Michigan is permitted to help or guide someone when bear hunting. You are restricted to just one bear each year and also you cannot trade your license to a different person. You are not permitted to reap any cubs or perhaps a sow (female bear) supported by cubs. If you are looking for country life outfitters, then Proudcountryclothing is the right choice for you.